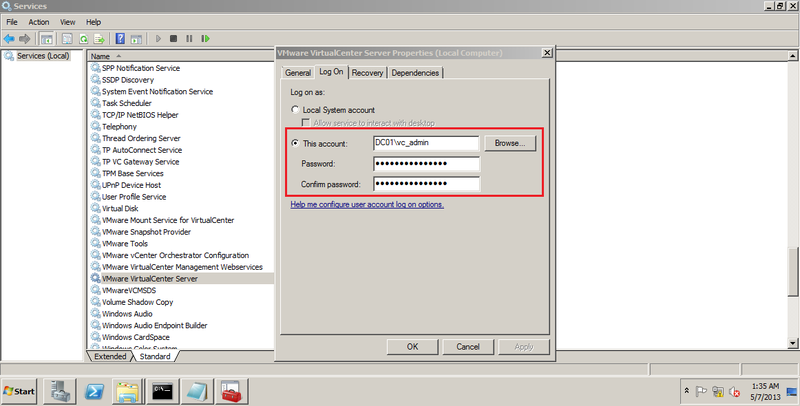 An user forgot the domain user password for SQL and Vcenter server; reset the password of the domain users. Unable to login to vcenter server with vsphere client, vsphere client said connection fail despite correct domain user credential was used to login. 1. 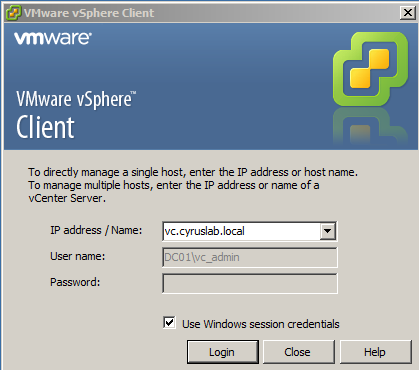 From vcenter server (vc.cyruslab.local), two services were not started namely VMware VirtualCenter Server and VMware VirtualCenter Management Webservices (This service can only be started after VirtualCenter server is started). These services should start automatically after successfully login to the domain. 2. User attempted to start the VMware VirtualCenter Server manually, however encountered an error that the services could not be started because of failed logon. 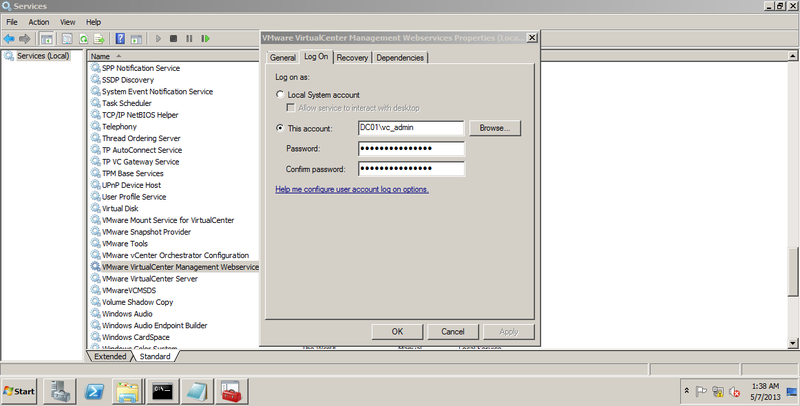 Right click VMware VirtualCenter Server service and choose properties. Click on Log On tab and manually type in the new password. Do the same for this service. 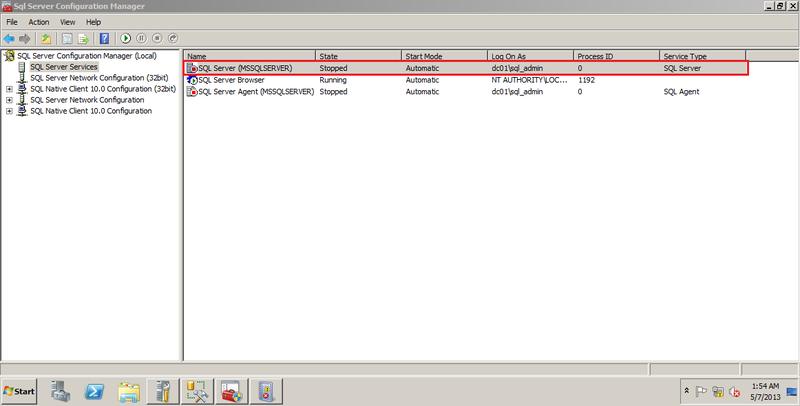 [2013-05-07 00:18:34.661 02692 info 'App'] Log directory: C:\Users\vc_admin\AppData\Local\VMwarevpx. [2013-05-07 00:18:34.661 02692 info 'App'] [VpxOsLayer] Enabled low-frag process heap. [2013-05-07 00:18:34.661 02692 info 'App'] [VpxOsLayer] Enabled low-frag crt heap. 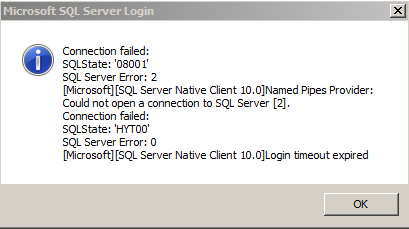 [2013-05-07 00:18:55.799 02692 error 'App'] ODBC error: (08001) - [Microsoft][SQL Server Native Client 10.0]Named Pipes Provider: Could not open a connection to SQL Server . 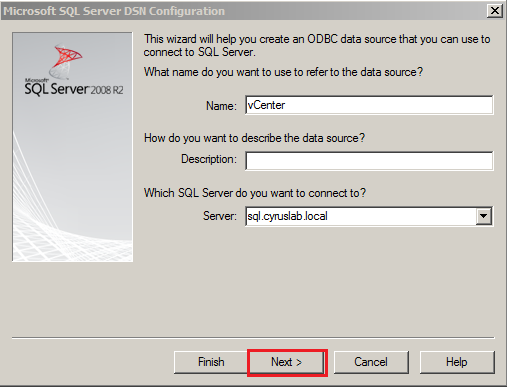 From the log it says vcenter cannot open the SQL database to check the configuration, user decided to test the connection from vc.cyruslab.local to remote SQL server connection. 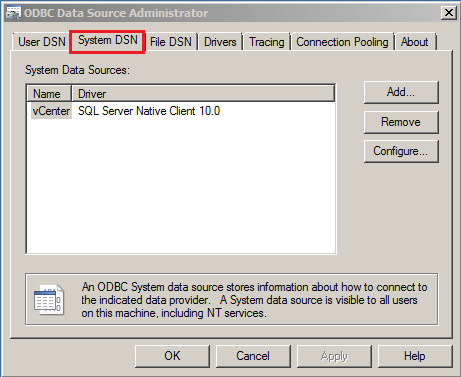 From Administrative tools select Data Sources (ODBC). SQL server could not be connected. This could mean either SQL was unreachable or SQL service was stopped. 5. 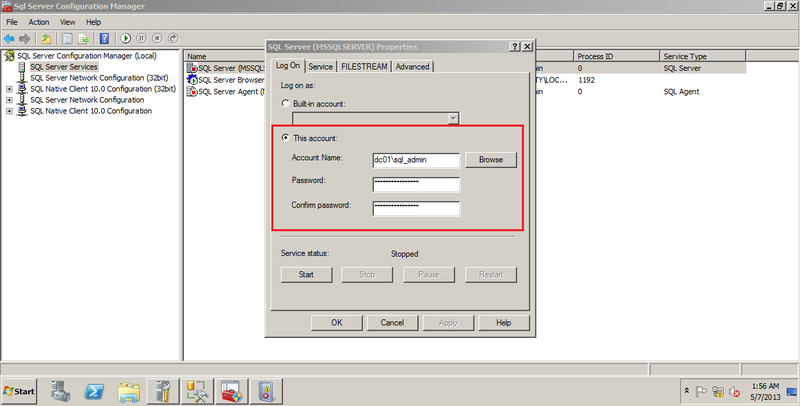 User used remote desktop and could remotely connected to sql.cyruslab.local, this showed that at least connection between vc.cyruslab.local and sql.cyruslab.local existed; it could be SQL service was not started. 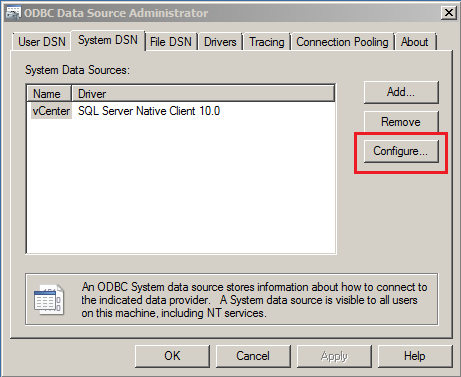 User open SQL server configuration manager. MS SQL service was stopped. 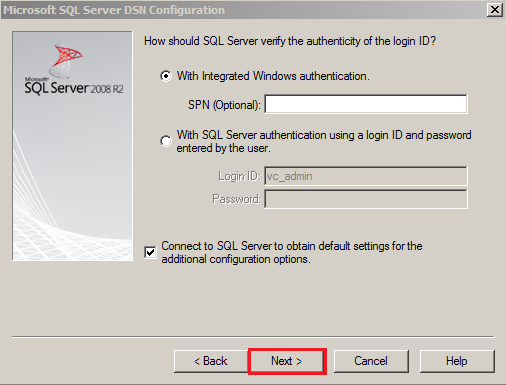 User attempted to start the service manually but could not, so user right click SQL Server and select properties. Manually type in the new password for the domain user account. 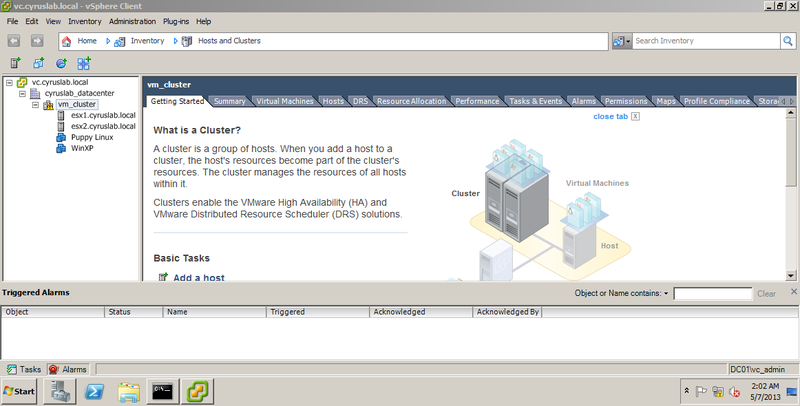 VMware VirtualCenter Server, it was successful! Then user attempted to start VMware VirtualCenter Management Webservices which was also successful. User then use vsphere client to login. This entry was posted in Tshoot, VMware and tagged ODBC error: (08001), troubleshoot vmware, vcenter server, vmware esx, vmware server, vmware virtualcenter server, vsphere client, vsphere client cannot connect to vcenter server. Bookmark the permalink.